Artistic depiction of the neuroanatomic pathway that conducts photic information from the retina to the suprachiasmatic nucleus (the biologic clock) and the multisynaptic pathway that conveys this information to the pineal gland. 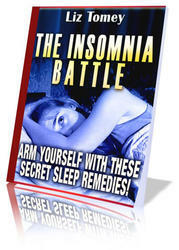 The pineal gland releases the hormone, melatonin, on a rhythmic basis, with the peak occurring during the dark period. 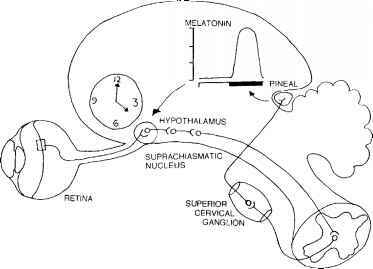 Melatonin is able to act on the suprachiasmatic nucleus and regulate "clock" function.